The King and I, the famous Broadway musical by Rodgers and Hammerstein, was based on a true story. A woman named Anna, was a governess to the children of the King of Siam (modern day Thailand) in the 1860s. She wrote two books about her adventures in Siam and they were subsequently published late in the nineteenth century - and became highly acclaimed. Later in the 1930s, a novelist and wife of a missionary in Siam came across this fascinating story. Her name was Margaret Landon, and she adapted the tale into novel form and titled it "Anna and the King of Siam" that quickly became a bestseller soon after its release date in 1944. Soon after, it was made into a Fox film. But it was as a Broadway Musical that this delightful story of Anna and the King would become enormously popular and timelessly riveting. In 1951, the famous duo of Rodgers (composer) and Hammerstein (lyricist) used their magic to produce a lavish stage production starring the well known Gertrude Lawrence in the leading role as Anna, and also featuring a relatively unknown actor named Yul Brynner as the King in a supporting role. What followed took the U.S.A. by storm! 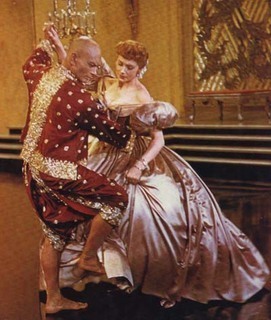 Considered one of the best Broadway musicals, The King and I opened on Broadway on March 29, 1951. It had rave reviews before the first showing! including Best Actress in a musical (Lawrence) as well as Best featured Actor in a Musical (Brynner). The King and I garnered a whopping 5 Academy Awards. This highly acclaimed musical remains a popular classic - possibly the "best of the best" of the Rodgers and Hammerstein musical productions. "Last night I saw the picture, The King and I, again. This morning, I am convinced that this is our best work. I have a kind of humble feeling of not knowing how we did it. It has more wisdom as well as heart than any other musical play by anybody. It will remain 'modern' long after any of our other plays." If you haven't seen the musical yet, watch it this week! You'll see why its story of hope in a clash of the cultures remains to this day. I'll be surprised if you're not singing Getting to Know You for many days afterward!